Lee & Low is a children’s book publisher focussed on bringing diverse voices to the forefront and promoting related conversations. 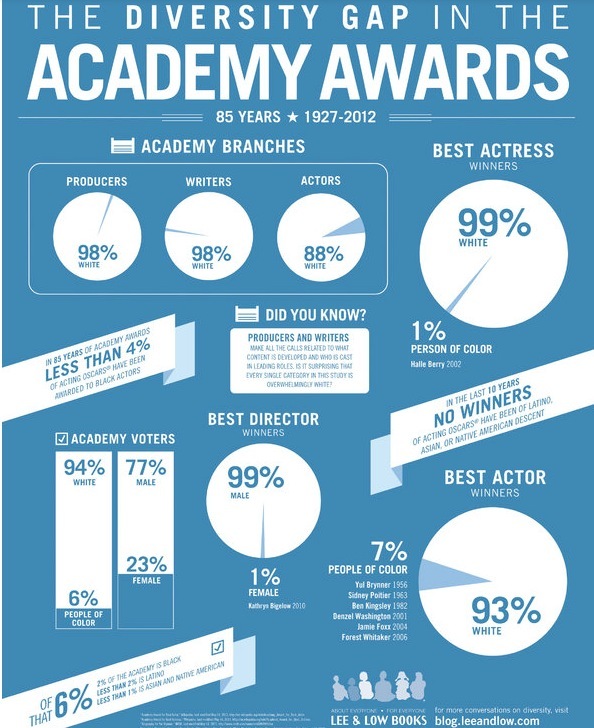 They produced this info graphic of the Academy’s track record on honoring the work of minorities. The backdrop to this includes an investigation by The Los Angeles Times in 2012. The Times found that the majority of Academy members are older white men, and of the 85 best actress awards, just one went to a person of color, Halle Berry in 2002. The Academy’s new president is Cheryl Boone Isaacs, the first African-American to do so. She and its chief executive Dawn Hudson are taking steps to increase diversity, which includes a diverse roster of faces for the March 2 show. Click here for interviews with independent filmmakers of color about their roles in Hollywood.